A blood-soaked black comedy, Fargo is a captivating classic. Joel and Ethan Coen conjure up a mood of dark doom set against a bleak snow-covered landscape, enlivened by unforgettable personalities and rampant "Minnesota nice" behaviour. In Minneapolis, car salesman Jerry Lundegaard (William H. Macy) is buried under a mountain of debt and has no apparent legal solutions to dig himself out. 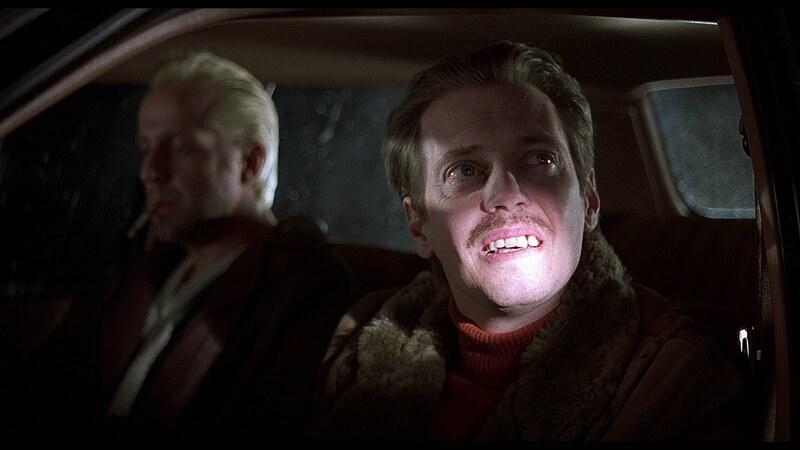 In desperation, Jerry meets career criminals Carl (Steve Buscemi) and Gaear (Peter Stormare) in Fargo, North Dakota, supplies them with a car, and hires them to stage the kidnapping of his wife Jean. Jerry intends to get the ransom money from Wade, his rich father-in-law, and then split it with the kidnappers. While Carl is thoughtful and just wants to get the job done, Gaear is silent and prone to extreme violence. After a clumsy break-in Carl and Gaear do succeed in kidnapping Jean, but on the highway near the town of Brainerd they are stopped by a highway patrol officer. Gaear brutally kills the patrolman and, for good measure, two witnesses who happen to be driving by. A staged hostage-taking is transformed to a triple murder investigation. Marge Gunderson (Frances McDormand) is the Brainerd chief of police, and seven months pregnant. Her investigations of the highway murders lead her to Jerry's car dealership, and his shifty behaviour doesn't help his cause. With the noose tightening around him, Jerry is desperate to close the ransom deal, but Wade insists on delivering the money, resulting in many more dead bodies. Marge has to quickly follow the trail of violence to put an end to the bloody carnage. 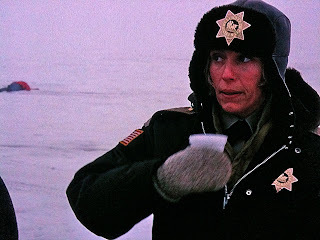 Fargo is a brilliant crime film, one of the finest achievements of the 1990s, and the jewel in the Coen brothers' crown. Working from their own script, the Coens find the dark soul of evil against the chilly white fields of snow, and juxtapose dry humour with unspeakable violence. In the most staid and seemingly content of mid-America environments, the story throws up a desperate husband, a botched hostage taking and heartless killers prone to extreme violence. All that stands between evil running amok and the restoration of some semblance of sanity is a pregnant small town cop. Although the film opens with the claim that the events portrayed are factual, this is part of the Coens' humour. In fact, the movie is only loosely inspired by a vaguely similar incident that occurred in Connecticut. Equally unhinging is the name Fargo: one scene is set in that city, and the rest of the story takes place across the border in Minnesota. Fargo draws its radiance from four unforgettable characters. 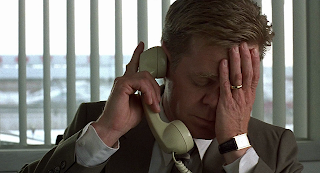 Macy successfully portrays Lundegaard as a man so in over his head that he is uncomfortable in own skin, just one step ahead of total despair. Buscemi creates an almost sympathetic character in Carl, a criminal who can only be described by all who meet him as "kinda funny looking". Violent only when driven over the edge by the apparent ineptitude of others, Carl is dangerously funny and always foul-mouthed. Stormare's Gaear is nothing but silence, incessant smoking, and brutality. This is a criminal who does not hesitate to kill quickly and at close range, and he does not really care who knows it. It is Gaear who derails Jerry's plan and sets off the avalanche of killings, and none of it seems to bother him. And finally McDormand's Marge slowly takes over as the heart of the film, almost cheerfully overcoming the challenges of her pregnancy to doggedly untangle the web of murders and bring the case to a close, while looking after her marriage and fending off a semi-psychotic suitor. The Coens direct with elegant understatement, allowing the scenery, the strength of the story, the exceptional characters and Carter Burwell's evocative soundtrack to breathe deep and confidently carry the film forward. Fargo's combination of character-driven comedy and cruelty is movie-making at its best.